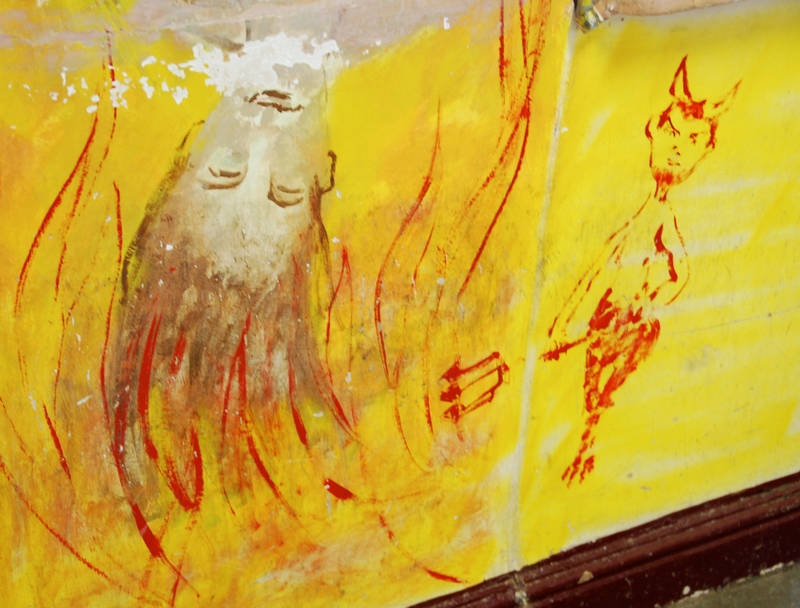 When Australian artist Clifton Pugh was visiting his mate Barney Davie at his outback pub in the late 1960s, he got stranded during a flood and in a fit of boredom started painting on the walls. 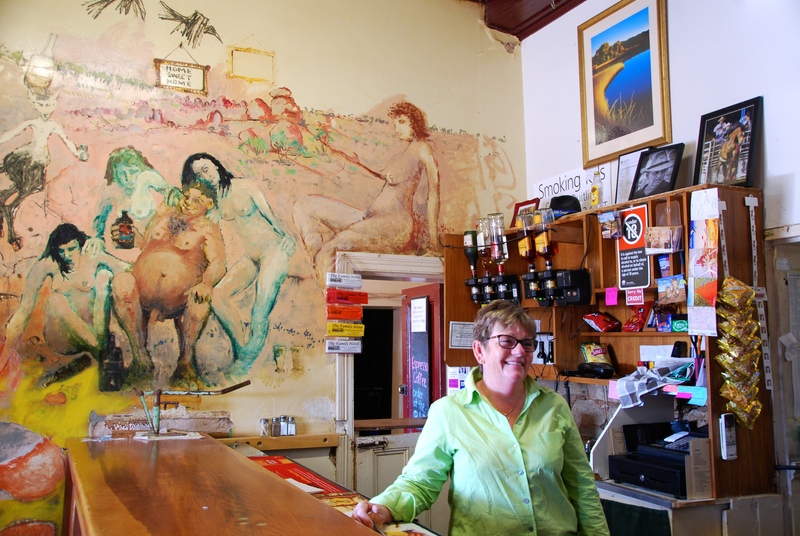 As Pugh’s reputation grew, the Family Hotel in the outback New South Wales town of Tibooburra became famous for its strange, colourful murals. “That was about 1969,” said current owner Melissa Thomson as I stood in the bar peering at the detail of these extraordinary paintings. Publican Melissa Thomson in the bar of the Family Hotel. And the devil really is in the detail. 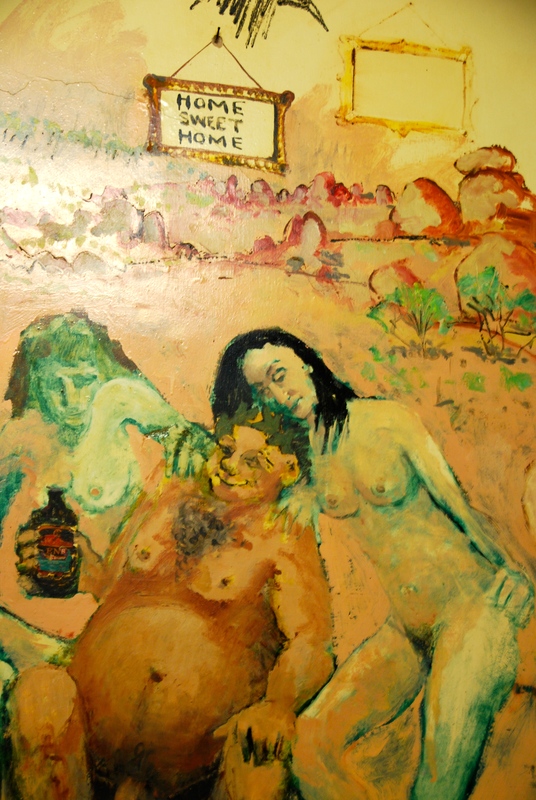 Pugh’s painting includes a naked devil (who apparently looked like his ex-wife’s boyfriend), and two female nudes (the pub owner’s daughters). But it was instantly controversial. Local folklore tells that complaints were made, and the cops turned up, ordering Pugh to paint over the devil’s offending appendage. He reluctantly painted a fig-leaf over it, but after the fuss had died down promptly restored the painting (and the devil) to its original – naked – state. Clifton Pugh became one of Australia’s most prominent artists, winning the Archibald Prize for portraiture three times, and being awarded an Order of Australia medal in 1985. He was also known for his landscapes and spent a lot of time in outback New South Wales, often bringing other artists with him. 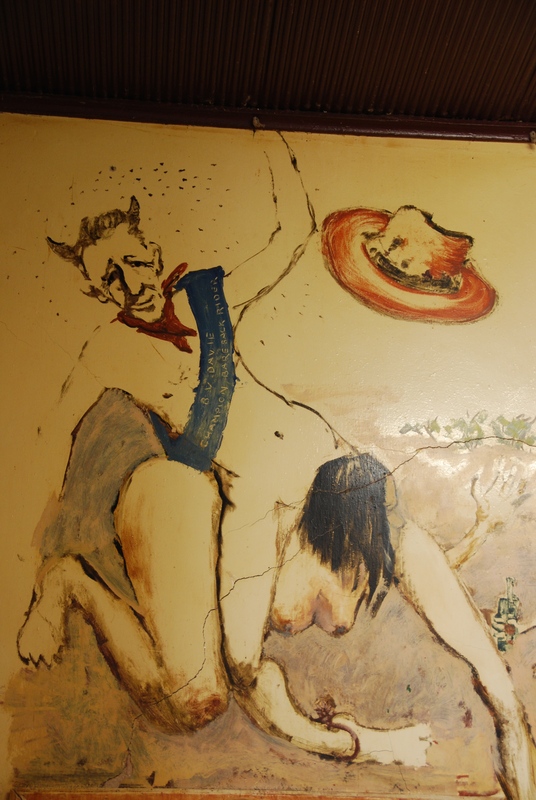 Over the years, other artists have added to the murals throughout the Family Hotel, without such controversy. If you ever get to Tibooburra, make sure you take a close look at them – the detail is intriguing and often amusing. Surrounded by rugged, open desert, Tibooburra is one of the hottest and most isolated towns in New South Wales, located about 1187 km (738 miles) north-west of Sydney and about 335 km (208 miles) north of the silver mining town of Broken Hill. It’s a friendly place, with a couple of pubs and plenty of accommodation for travellers heading to Sturt National Park and “corner country” where the borders of New South Wales, Queensland and South Australia meet. That phrase – “the devil’s in the detail” – was the first thing that popped into my head when I saw “details” as this week’s travel theme challenge from Ailsa at Where’s My Backpack? And when it did, I instantly thought of this great outback story. A Glass Half Full visited Tibooburra as a guest of Outback NSW and New South Wales National Parks. I love this kinds of stories. Long live creativity. I think you’d love this little town, the pub and the naked bodies on the walls, Goddess. And you’re right – so many interesting stories and creative souls out there in the wide world. I like the first mural you showed. This artist definitely seems to be saying something. Yes, he does – and it sounds like it was quite a personal message! Oh yeah, ya gotta love a great story from the bush. There is nowhere quite like the Australian bush for great stories, is there? No, so close the computer and go bush.